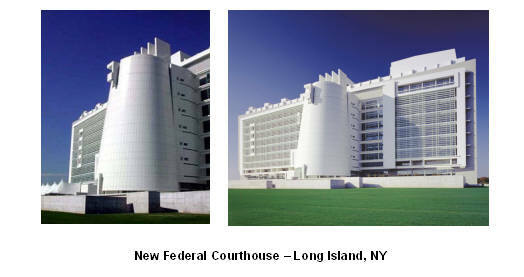 The gleaming white architecture housing the Long Island Bankruptcy Court has been controversial since the building was opened in the fall of 2000. Designed by renowned architect Richard Meier, the Central Islip building looks like a large, stark, white rectangular monolith with a missile silo in the middle. The $190 million, 850,000-square-foot-building, at 11-stories tall, is the tallest building in Suffolk County. However, some attorneys called the building a “monstrosity,” “ugly and totally out of context,” and “sterile and completely inappropriate,” according to a New York Times article published when the building had just opened. From the upper floors, looking to the north, you can see a good amount of Long Island. Looking to the south, you can see Fire Island, the Great South Bay, Robert Moses bridge, the lighthouse and the ocean. The building contains 23 courtrooms, one special proceedings courtroom, 13 District courts, four Magistrate and five Bankruptcy courtrooms. In addition there are spaces for 25 judges chambers, a law library, offices for Federal agencies and a cafeteria. The building is 235 ft. tall and is one of the tallest structures on Long Island. Entry to the courthouse is via a raised stone podium, with landscaping and reflecting pools, to a conical drum (the so-called missile silo) that leads to an 11-story atrium. This entrance rotunda is 175 feet tall and devoid of floors, having tapered round walls that are structured out of a huge steel space frame. According to a description from architectural magazine Archidose, the atrium acts as a focal point and a means of orientation. Public corridors extend from the atrium along the south curtain wall, overlooking the plaza below and the Great South Bay and the Atlantic Ocean beyond. The north side houses the offices and the judge’s chamber: the elevation articulated accordingly with narrow ribbon windows. These two distinct facades are separated by a pair of walls that peak above the adjacent parapets, intersecting the atrium. The distinction between the two sides of the building is both formal and programmatic, acting as a separation between public and judicial circulation.